It’s amazing what a little fruit sauce can do. Making fruit a little extra special always turns something standard into a little party! 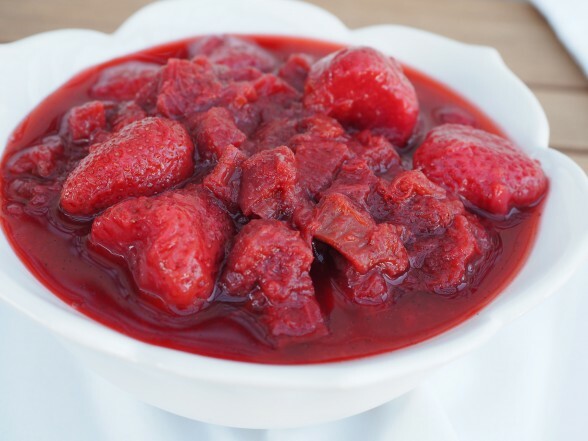 I used to make this strawberry-rhubarb sauce to go with the Lemon-Ice Torte that I have been preparing for Passover since I graduated from college. (If you’re new here, that was a loooooong time ago.) I have always thought that the torte is delicious on its own, so one year I decided to stop making the sauce. No one will miss it. Wrong! There was a revolt. I should have realized that would happen since my family loves all things fruity and saucy. Even though I can find fresh rhubarb for a few weeks in the spring, I still follow the original recipe and use both frozen rhubarb and frozen strawberries. These fruits make such a classic spring combo. Unfortunately, because rhubarb is a tad tart, so many strawberry-rhubarb recipes are loaded with sugar. I used as little coconut sugar as I my family would allow here, but feel free to adjust according to your taste. I also tested this with maple sugar and I couldn’t tell the difference between the sauce with coconut sugar and the maple sugar. 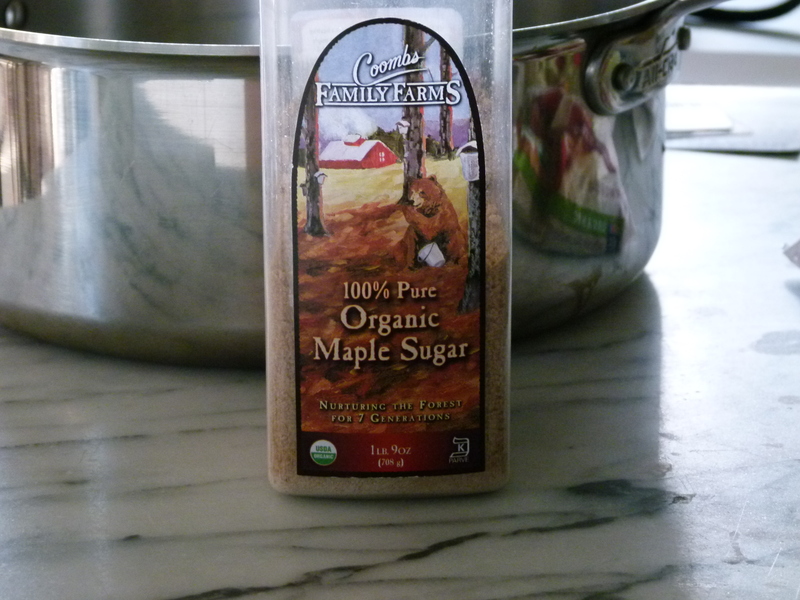 Both are less refined sweeteners, but coconut sugar is a fraction of the price of maple sugar, FYI. I thought this might be nice recipe to make for Easter since you can make it today and keep it refrigerated until Sunday. The sauce goes beautifully with pancakes, French toast and waffles for brunch, or Greek yogurt and granola. Or serve it over a simple pound cake or the Lemon Ice Torte I posted a few years back. Even if you’re looking to make this for a “special occasion,” the sauce is delicious on oatmeal, matzoh brei, frozen yogurt or ice cream. The truth is, this sauce is really simply to make, especially if you use frozen fruit. You need no particular reason, no occasion to turn any day into something special! Combine half the sugar and all of the water in a heavy medium saucepan. Scrape the seeds from the vanilla bean into the pot along with the pod. 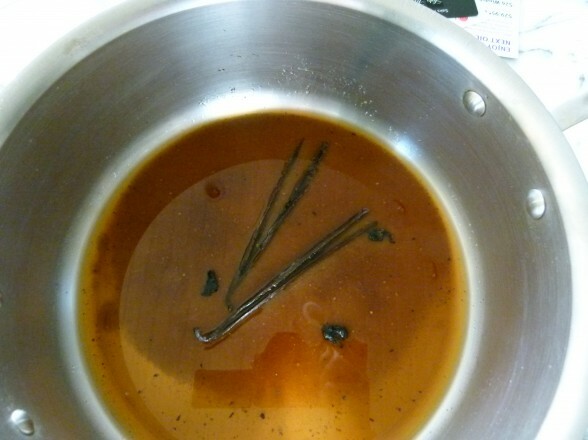 Bring to a boil, lower to a simmer and cook for 5 minutes. Add remaining sugar and stir to dissolve. Add rhubarb. Bring to a boil, reduce heat, covered and simmer until rhubarb is just tender, about 8 minutes. Add strawberries and bring to a simmer. Cool. Cover and refrigerate until chilled. Can be prepared several days ahead. 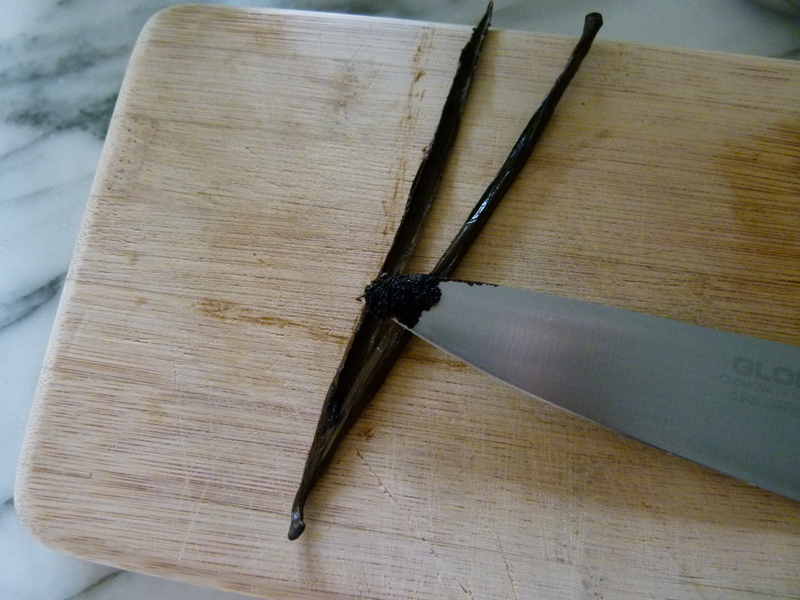 Remove vanilla pod before serving. Does anything need to change if using fresh fruit? Good question! Maybe, maybe not. Basically, you want to cook the rhubarb until it’s tender. I would check it after 8 minutes and if it still needs time, figure another 5-7 minutes. 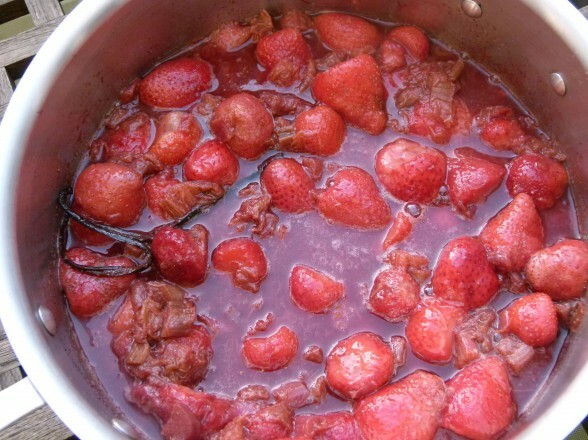 Then add your strawberries and cook until they’ve gotten tender. But there shouldn’t be a significant difference in cooking time. Will it be good with just strawberries? I don’t have vanilla bean. Can I use just regular vanilla? Sure! Just sub the more strawberries for the rhubarb and cut the sweetener a little. 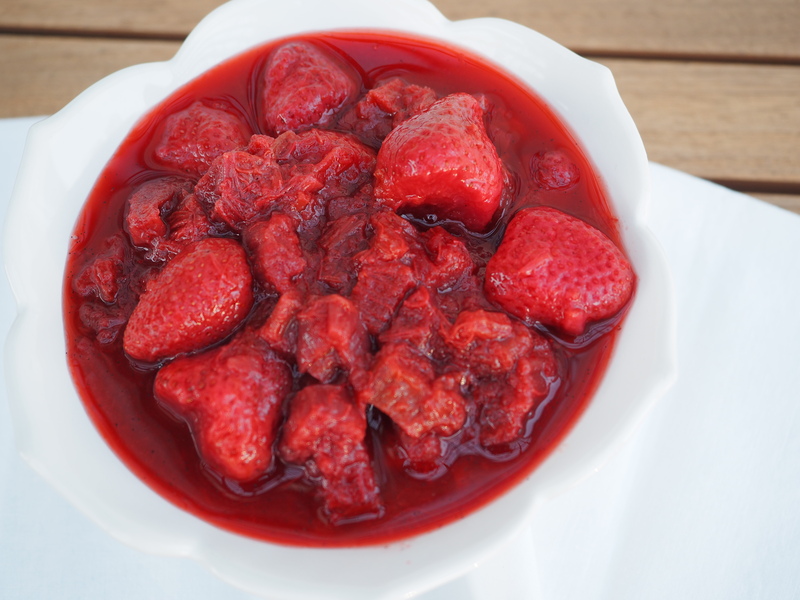 If you don’t sub more strawberries for the rhubarb, then you will have to decrease the water and sweetener accordingly. Use a teaspoon of vanilla instead of the bean. Not the same, but still good!